The Australian White Ibis (Threskiornis molucca) is a ibis from the family of Ibissen en lepelaars (Threskiornithidae). 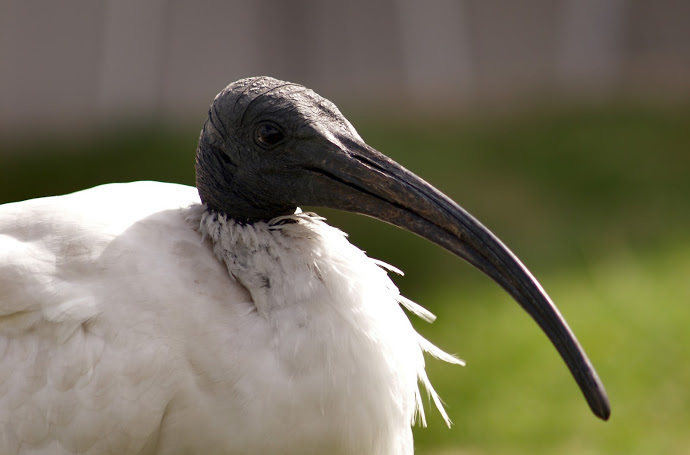 Australian White Ibis have a large white body, a featherless black head and neck and a long black downward curved bill. Adult males are slightly larger than females and have also a slightly longer and more robust bill than females. Chicks have a feathered head and neck and a short straight bill. As juveniles mature they lose the head and neck feathers and their bills grow. During foraging, small interactions can occur between companions, such as pecking without making contact. This happens especially when there is a fight about the same piece of food. There is a kind of hierarchy (dominance) among the males about obtaining food. Males also dominate the females, but they are much more tolerant towards each other. Short fights also take place during courtship, pair formation, construction of the nest. 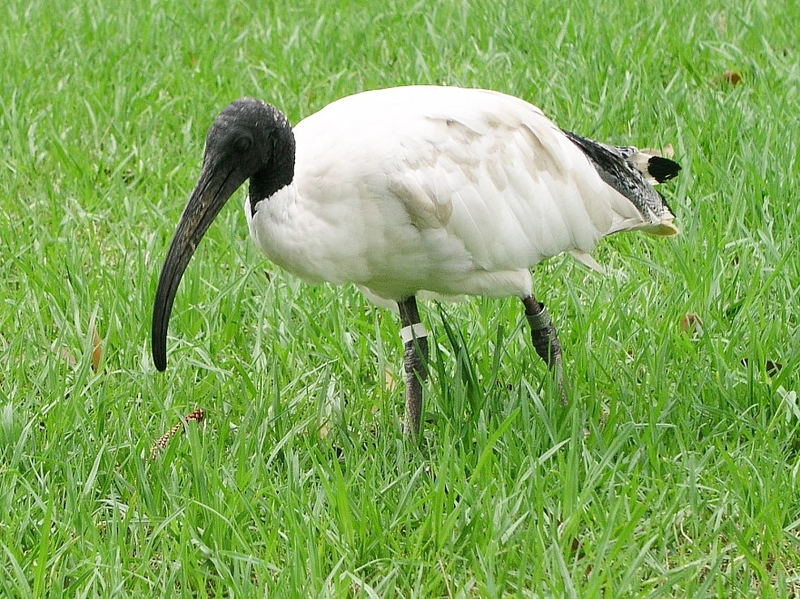 The male (drake) of the Australian White Ibis measures approximately 65-75 centimeter. The female measures approximately 65-75 centimeter. The male will weight about 1700-2500 gram. The female will weight about 1400-1900 gram. T. m. molucca of eastern Malesia and Australia, is the nominate subspecies. T. m. pygmaeus (Solomons white ibis) is a dwarf form found on the Solomon Islands that has been considered a separate species at times. Terrestrial wetlands: They prefer shallow water with a soft soil or muddy plains such as marshes or lakes. Grasslands: Wet grasslands or agricultural land when there are enough invertebrates alive. Wet meadows and marshes with low vegetation are suitable. Grasslands are suitable during and after mowing because many invertebrates and narrow vertebrates are killed. Sheltered coastal habitats: salt habitats such as estuaries, mangroves, salt plains, salt marshes, lagoons and beaches are sometimes used. Artificial wetlands such as water reservoirs, dams and water purification stations. Urban environment: Gardens, playgrounds, roadsides, parks, etc. They make their nests in the forks or on large branches of trees. This nest can be up to 30 m high, but sometimes even above the ground or even nestled on the ground. Sometimes used a nest year after year, but mostly by other couples. Both partners are building the nest that consists of twigs, leaves, reeds, water plants, etc. They start the construction two to three days before the first egg is laid. Regularly the construction of the nest is stopped suddenly and is restarted at a different location. 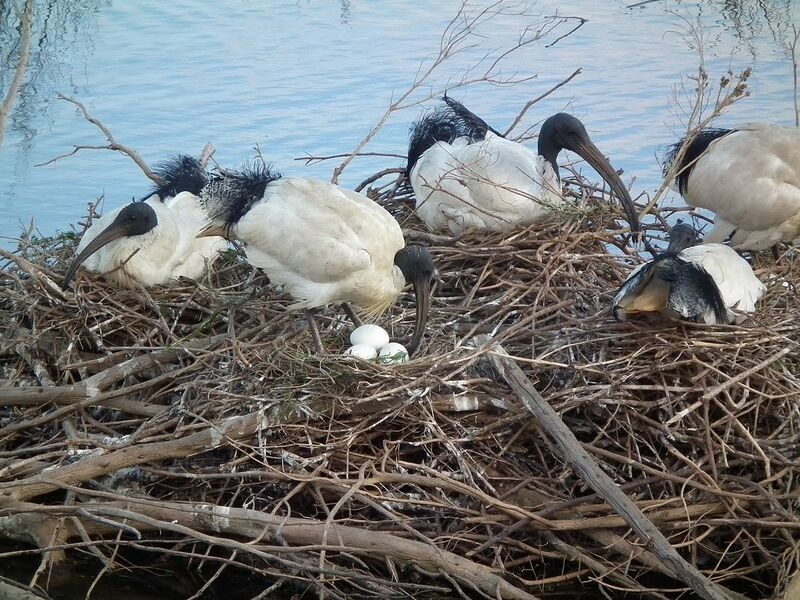 The female Australian White Ibis usually lays from 2-3 dull white eggs and incubates them for 20-23 days. Recommended leg band size for the Australian White Ibis is 14 mm. The leg band can only be applied on a young ibis at around 14 days old.